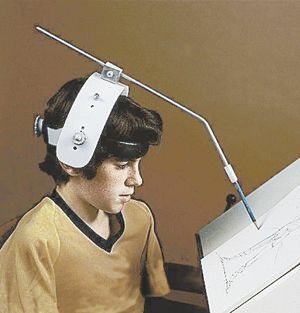 Aids individuals with limited hand use in writing, drawing, turning pages, or activating switches or controls. Angle of rod can be adjusted. Includes a removable pencil holder. Head band is adjustable and padded for comfort. Can be used to turn pages in a book. 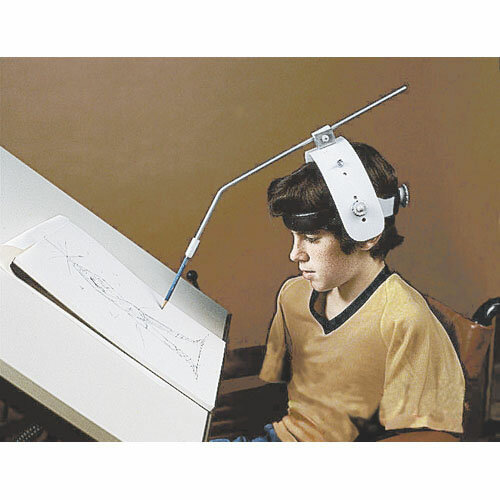 The Adjustable Head Pointer assists individuals with limited hand use in writing, drawing, turning pages, or activating switches or controls. This adaptive device can also help people with limited verbal communication skills to use communication boards. The head piece consists of adjustable lightweight plastic bands for fitting individual head sizes and shapes. The bands are secured with metal hardware, and topped with a 19 inch aluminum pointer rod. The bands are padded for comfort. The pointer rod is length and angle adjustable in any direction, and is fitted with a removable pencil holder. Length: 19 inch long aluminum rod.